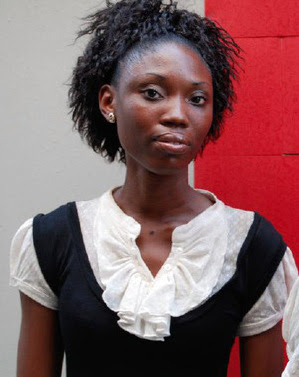 After close to 1 and a half years, Uzoma Okere, the young lady who was infamously dragged out of her car, stripped of her clothing and beaten on a busy Lagos street in November 2008 for not moving her car quickly enough out of the way for some officials of the Nigerian navy, was given the justice she so richly deserved. Delay tactics from the defendants' lawyers notwithstanding, on Wednesday, January 27 Justice Opeyemi Oke of the Lagos High Court awarded N100 million damages to Ms. Okere and Mr. Abdullahi Abdulazeez (a passenger in her car who was also physically assaulted by the ratings) and ordered that a public apology be made to them through the media. She found Rare Admiral Harry Arogundade, four naval ratings, and the Nigerian Navy guilty of violating the rights of the applicant to dignity. 3. If the applicants are entitled to the reliefs being sought by them. The footage shot of the event by a witness from the nearby PriceWaterHouse office building was invaluable in proving the 1st point, as it was obvious from the recording that Ms. Okere and Mr. Abdulazeez did indeed have their rights violated. "I saw 4 officers in naval uniform, two were holding guns; the 1st applicant was being dragged on the road by the two officers; the applicant became naked from waist to her chest with only her black brazier on." She resolved that the applicant's right was indeed violated. "She was beaten, pushed, pulled, dragged and made naked with her upper anatomy exposed to all sort of eyes; her private property became the object of a cinema for those who witnessed the unfortunate and disgraceful incident." she said. Pertaining to the naval ratings that perpetrated the act, Justice Oke said "the officers can be described as barbaric in uniform, who have no respect for womanhood, they have no fear of God. It has got to a time when such officers may have to undergo psychiatric test before being employed." In determining the 2nd issue i.e. if the 1st and 6th respondents are liable, the judge noted that an employee is the agent of his employer, and such is liable for the wrong doing of his employee. "Blessed shall be the day when civilians will see uniformed men, armed or unarmed officers, and feel secured without any anxiety for their lives. Blessed shall be the day when uniformed men will treat civilians on the road with respect and come to the realisation that they are citizens of the country who are to be protected," declared Justice Oke. I pray for that day too, because for too long, the uniform has been used by many who wear it to oppress and take advantage of the very citizens these people are meant to protect. I am happy that justice was served in this case, though it is painful still to know that these ratings and Mr. Arogundade are still serving in the Navy. I Nigeria still has a very lax attitude towards implementing punishment to wrong-doers. This continues to send the message that injustice, corruption, oppression and all manner of violations of the law are permitted by the very institutions that are supposed to be the enforcers of law and order. Yesterday I saw a police convoy of 2 cars belligerently barge their way through the tedious traffic on Ozumba Mbadiwe. Are they in anymore of a hurry or traffic-averse than the rest of us? Or are they merely abusing the power that their uniform has given them? I think so. 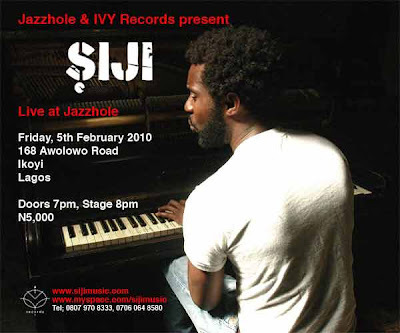 The artist Siji will perform tracks from his new album release, adeSIJI, at The Jazzhole, Friday, 29th January, 2010. Siji, spent much of his early childhood in Lagos and London before going to the US to further pursue his musical ambitions. His cultural heritage combined with the political and social movements of the age, exposed a young Siji to the insurgent, politicized music of the Afrobeat legends Fela Kuti, King Sunny Ade, Tony Allen as well as the soulful grooves of Marvin Gaye, Al Green, and Otis Redding. His parents, in particular, his father, loved music, but like most children of hardworking immigrants, Siji was urged by them to pursue a career in the professional fields of medicine or law. But the lure of the music was too strong. In the nineties, when London was bursting at the seams with new music and groups like Loose Ends, Soul II Soul, and D-Influence dominated the scene, Siji’s attention was captured and he began to follow his passion for making and recording his own music. Siji relocated to New York and performed in renowned venues—SOB’s, Bam Café and Joe's Pub. He has worked with a number of producers, but it is his collaboration with Osunlade, who produced music for Musiq Soulchild, Eric Benet, and classic R&B vocalist Patti Labelle, that has fostered in Siji a love of production. He has contributed songwriting and production talent to projects for Salif Keita, Cesaria Evora, Vinia Mojica and Wunmi. Along with those skills, Siji brought with him the immediate feedback and positive energy of the live performance into the studio, creating songs that would eventually make up his debut album God-Given (BBE Records, 2004). Tickets can be purchased from the Glendora website. Book Launch: Wale Okediran launches 'Tenants of the House' at the Nigeria Institute of International Affairs, Kofo Abayomi Street, Victoria Island, Lagos on Thursday, January 28 at 10AM. Play: 'Call Mr. Robeson', a musical drama by Tayo Aluko at the Agip Hall, MUSON Centre, Onikan, Lagos on Thursday, January 28 and Friday, January 29. Play: 'Waiting Room' produced by Theatre@Terra at TerraKulture, Tiamiyu Savage Street, Victoria Island, Lagos every Sunday in January at 3PM and 6PM. Art Exhibition: 'CCA and Nigerian Art' News through the eyes of artists, featuring artists based in Sweden and Lagos at the Centre for Contemporary Art (CCA), McEwen Street, Sabo, Yaba, Lagos on Friday, February 4 at 7.30PM to 8.30PM. Unless you have been living under rock, you would have heard about last week's earthquake in Haiti and the aftershock that followed today (which had a magnitude 6.1 on the Richter Scale). One thing you might not be aware of is the role that technology –particularly new media – has played in providing information on the ever-changing conditions in the country. As a result of the destruction of the phone lines on the island, it was difficult to know how widespread the damage by the earthquake was. However, the network infrastructure survived making it possible to communicate via the web and Haitians in the Diaspora were able to check on the well-being of their relatives back home. they [people in Haiti] used mobile phones and the web to inform about structural risks, lack of water and food, and missing persons. "We translate it, map it, and structure the data," said Ushahidi co-founder Erik Hersman. Ushahidi made an agreement with local mobile phone operator Digicel and created a short code to which people could text their message. That message is received by "situation rooms" set up in Boston and Washington. A third one will be set up in Geneva to provide 24-hour cover. About 10,000 Haitians have volunteered to translate messages from Creole to English and ask for more information if needed. Other volunteers and experts try to verify the information and put it into the map. This is crowdsourcing on a big scale. A Wordpress-powered blog called Haitifeed is also delivering a steady stream of first-hand accounts as well as mainstream media reports from across the globe. Reports from citizen journalists are also coming in to CNN’s iReport desk where they are vetted by CNN’s editorial staff. On Facebook, a group called Earthquake Haiti already has over 14,000 members. The group is largely being used for people to show support and trade news reports; however, there are some users who seem to be posting critical information including pleas for assistance to injured Haitians. "Technology in itself does not lead to social change. For change to take place technology needs to be appropriate and rooted in local knowledge. People decide why and how a particular technology will be used and, depending on the political and socio-economic environment in which they live, adapt it accordingly." Social media has played a pivotal role in getting and disseminating information in the last eight days and we probably are only scratching the surface in exploiting its diverse uses. How far can blogging take you? Very, very far apparently. Last year BlogHer announced scholarships to attend the annual BlogHer annual conference for women using their blogs for activism. Among the winners was Standtall, the prolific blogger at the award-winning The Activist blog. On The Activist, Standtall or Toyin Ajao (as she's otherwise known) discusses issues related to making the world a better and more equitable place for women. At BlogHer '09, the activists shared their work and passions with the conference attendees. The program was such a success that BlogHer has decided to make this an annual initiative. You can nominate yourself or a deserving woman who is using her blog to change her community for good for the BlogHer 2010 International Activist Scholarship Program. Get more information on the BlogHer site. I feared that this would happen. I returned to work and have not finished the book I started weeks ago. It's not a lack of time, more like a lack of discipline. Well perhaps the next best thing to reading might be watching a film about people reading. Or maybe not? LOL!!!!! I saw The Jane Austen Book Club over the weekend about ..... well the title says it really. So, a group of friends decide to start a book club devoted to discussing the works of Jane Austen only, because not only do they all love her books, they have also read them all and so don't have to take on the arduous task of reading new books for the club. The film is quite predictable and revolves around many themes present in Jane Austen's books: love; independence; breaking free from the status quo; being true to one's self; and repression. I enjoyed it and it was the type of film that I needed to watch now. I'm addicted to my new favourite blog, Confessions of a Pioneer Woman, which I discovered a year ago but never read. Now I wonder why. Each day I can't wait to see her latest photos of her life on a ranch. I enjoy reading recipes and seeing pictures of sumptuous-looking dishes that I'll probably never make. More importantly at this time, I'm reading her serialised story of how she met her cowboy husband, Marlboro Man. I came across a report by Philanthropia Inc. on patterns in international funding for NGOs in the last year. Philanthropia specialises in international fundraising and philanthropy, advising nonprofit organisations in their fundraising efforts. This report surveyed a small sample of NGOs around the world. It mentioned something that I have heard before that for many nonprofits, most of their funding - in this case 37% - comes from private donations (see below). Foundations provide 19%, government agencies 18% and corporations 13%. 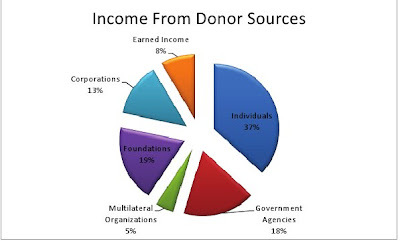 Although it is important that nonprofits generate income of their own through services rendered and products sold, this only accounted for 8% of overall funding. This makes some sense, because ideally the organisation needs to focus on implementing their mission and the services or products provided are typically offered to the beneficiaries free of charge or at a highly subsidised cost. 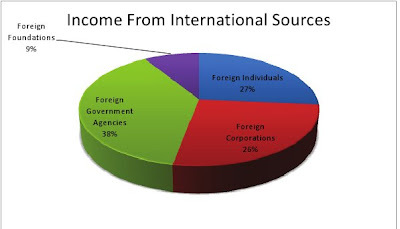 For those organisations that received international funding (73% of respondents), most of the money came from foreign government agencies (see below). For 70% of the nonprofits, the economic recession affected their operations, via loss of donors; having to devote more time and staff to fundraising; embarking on new fundraising initiatives; and letting go of some staff. Notwithstanding, many organisations were optimistic that it would be easier to get international funding in 2010. 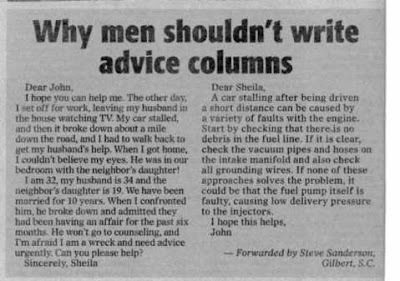 An addendum to my earlier post on how women and men regard the world. Elizabeth Gilbert, the author of the gazillion-selling Eat, Pray, Love is out with a new one called Committed: A Skeptic Makes Peace with Marriage. Committed follows off from where EPL leaves off and explores the institution of marriage. I haven't read EPL yet, so I can't say much either way about it. I am curious to read Committed though, because I am fascinated by marriage and learning about what makes for a good one. An interesting statement made by Ms. Gilbert in this interview on the Goodreads website is that marriage does not benefit women as much as it does men. Her thinking is that women go into marriage with extremely high ideals and are frequently brought crashing to earth in disappointment. Men, on the other hand, enter into legal unions with reluctance, scared of losing their independence and becoming trapped, and then find themselves pleasantly surprised and think "Oh, this is actually quite nice." Of course, I am sure that traditional gender roles play a big part in adjusting people's expectations once within the institution. Another interesting thing she says, which goes against popular thinking is that the more educated, independent and successful a woman is, the more content she is in her marriage. I can't count the number of times I have heard it said (and it's usually from men, sorry guys) that the more educated a woman is, the less likely she will make a good wife (the characteristics of a 'good' wife is a subject of discussion for another day). I never really wondered how come boys aren't reared on the same delusional stories. However now that I think about it, I realise that it's no wonder that there can be such a difference in how the sexes largely approach relationships. Thinking about how to use social media for your organisation? Check out this article on Web Doctor. The diagram below gives a good depiction of ways that you might think about using social media. The 10th Annual Grace Hopper Celebration of Women in Computing (GHC) has opened its Call for Participation. The annual conference, presented by the Anita Borg Institute for Women and Technology, is the world's largest gathering of women in computing. 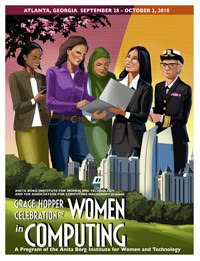 The Grace Hopper Celebration will take place from September 28 - October 2, 2010 at the Hyatt Regency in Atlanta, Georgia. This year's theme "Collaborating Across Boundaries" recognizes the significant role women play in using technology to work together across various borders including gender, scientific, social, geographical, racial or political. The submission deadline is March 16, 2010. Notifications on the submission status will be sent out by May 18, 2010. For more information, please visit the GHC website. The Grace Hopper Celebration is designed to bring the research and career interests of women in computing to the forefront. Learn more about the call for participation. The Charles Pick Fellowship is dedicated to the memory of the distinguished publisher and literary agent, Charles Pick, whose career began in 1933 and continued until shortly before his death in January 2000. He encouraged young writers at the start of their careers with introductions to other writers and practical and financial help. The Fellowship seeks to continue this spirit of encouragement by giving support to the work of a new and, as yet, unpublished writer of fictional or non-fictional prose. Its purpose is to give promising writers time to devote to the development of his/her talents. The Fellowship will be for six months, starting on 1 September, 2010. The award is £10,000. For more information, visit: www.uea.ac.uk/lit/awards/pick. Check the GSBI™ website for more information. The Centre for Development Informatics at the University of Manchester is seeking high-quality PhD and DBA candidates to research topics on ICTs/information systems and socio-economic development. Some scholarships are available for those starting in September 2010. Deadline dates vary but many require application before end February or end March 2010. Selected candidates will join the Centre for Development Informatics, the largest academic group working on issues of ICTs in developing countries. Further details about application and scholarships can be found at: www.sed.manchester.ac.uk/research/cdi/postgraduate/. Opportunities abound this week for those in the social development sector. Fellowship Information: A 12-18 month management and development training program (J-1 program). Atlas Corps pays for all of the expenses of this prestigious fellowship. Classes start twice a year, in April and in September and take applications year round. To Apply: Send a resume and cover letter ASAP to apply@atlascorps.org. Visit the Atlas Corp website to learn more. One of my annual goals is to visit at least ONE new place every year. Last year wasn't so great for travelling, but I did visit Tucson, Arizona for the very first time. I'd wanted to go to Arizona for many years and never did manage to go there even when I lived in the same country. Here is a lady who did much better, clocking about 100,000 miles last year. I actually discovered Kristin's blog - Camels and Chocolates - about this time last year, subscribed to her feeds and never once read her posts. So today I decided that I'm subscribed to too many blogs that I don't read and started going through them (when I should be working on a proposal BTW). I clicked on her feed with every intention of unsubscribing. To say that reading a year worth of posts about exciting-looking locales transported me from my small office and this dreary day to more interesting places is an understatement. Adding to my To Do is to MAKE SURE that I visit at least TWO new places this year (baby steps afterall). That and to visit Camels and Chocolates regularly. Yay!!! It's a new year! 2010. I can hardly believe it. I wonder where the last year went to. It feels like just yesterday that it started and now it's over. It was a mixed bag of a year, with some phenomenal things happening to me. I met some incredible people, visited one new city - Tucson, nourished and grew my knowledge and relationship with God, became more comfortable as a Christian and a feminist, enjoyed time with the people I love and became more comfortable in my own skin. The non-profit I run survived it's first economic recession (or should I say, is still surviving ....) and our staff (including myself) won awards for our work. Of course, it was also a very challenging year in many ways. The recession was hard on our fund-raising efforts. Proposals were turned down left, right and centre, which was disappointing. However, I am still here surrounded by family and friends and for that, I am utterly thankful. This year, I promise to make more time for fun and friends. I make that promise EVERY year and so far I don't think I have kept it as faithfully as I set-out to. I'll strive to make this year different. Here's wishing everyone a 2010 that is unrivaled in terms of blessings, success and joy.